This Dressage Pad is breathable and ventilated, forcing air through hundreds of mesh openings and vents located throughout. This convection process allows air to circulate freely over the back, regulating body heat to milder temperatures and providing soothing relief to areas of discomfort. ECP non-slip pads will mold to the contour of the horse's back. This keeps the saddle in place and the pad retains its original shape after each use. This helps prevent excessive sweating, keeping your horse's back cool and dry. ECP pads are breathable, lightweight and shock absorbing, offering the horse superb comfort in the saddle. ECP pads are 100 percent recyclable and can be used with or without another pad for added comfort. Perforated silicone gel pad provides lightweight comfort and excellent grip. The withers and edges around the cantle area a covered in plush natural sheepkin for added comfort. No more slipping saddles or sore backs! 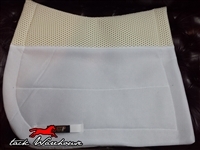 This Eventing Pad is breathable and ventilated, forcing air through hundreds of mesh openings and vents located throughout. This convection process allows air to circulate freely over the back, regulating body heat to milder temperatures and providing soothing relief to areas of discomfort. ECP non-slip pads will mold to the contour of the horse's back. This keeps the saddle in place and the pad retains its original shape after each use. This helps prevent excessive sweating, keeping your horse's back cool and dry. ECP pads are breathable, lightweight and shock absorbing, offering the horse superb comfort in the saddle. ECP pads are 100 percent recyclable and can be used with or without another pad for added comfort. Keep your saddle in place! The fully contoured top line ensures comfort for your horse. With an added 1.5cm open cell breathable foam cushion in the seat, these pads offer extra shock absorption and stability. The air flow grip bottom layer is completely breathable. A soft satin fabric on the wither area is used to ensure comfort. Easy to wash with a non-bleach detergent in warm water. Hang to dry.